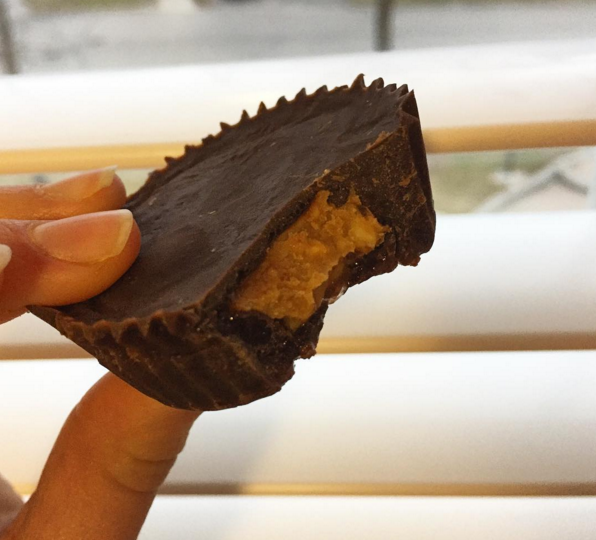 A couple days ago, I posted a picture of the peanut butter cups I made. I cannot count the amount of people that messaged me inquiring about the recipe. Now just keep in mind, these peanut butter cups are not nearly as creamy or soft as the original Reeses, but they do taste good. I took inspiration to make these after seeing spinach4breakfasts post (http://www.spinach4breakfast.com/raw-peanut-butter-cups/). I slightly adjusted a couple things. Anyways let’s get right into it! Stir in the rest of the ingredients into the coconut oil. Line a muffin tray with 4 muffin cups. Pour some of the chocolate mixture into each of the cups (enough to cover the bottom, so not that much). Spoon about a tablespoon of nut butter into the cup (or more if you want)! Slightly flatten the nut butter around. Pour more chocolate over this until it covers the nut butter.